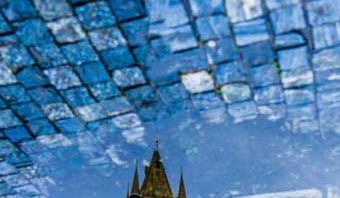 In the days following the end of the Second World War, the words of German poet Theodor Adorno reverberated throughout the world of the arts, from the literary to the visual. The nihilistic spasms of humanity, the absurdity of life and war triggered the world of Western arts into an era of profound transformations. Abstract Expressionism, the first American artistic paradigm with international influence, was born out of a rejection of European modernism and the emergence of a stern artistic brutalism, influenced by the tensions in international relations at the time. Pollock belongs to this New York School, which took control of artistic theory in the context of bipolar global politics of the Cold War. The power of Pollock’s work and the myth around his life are still evident today. Fifty years after his death, some paintings attributed to the artist are not recognized by the Krasner-Pollock Foundation, an institution established by Pollock’s estranged wife and fellow Abstract Expressionist artist, Lee Krasner. Some time before Pollock’s death, he and Krasner had separated, and she was contemplating putting an end to her unhappy marriage. Passion, love affairs, and a clash of egos. 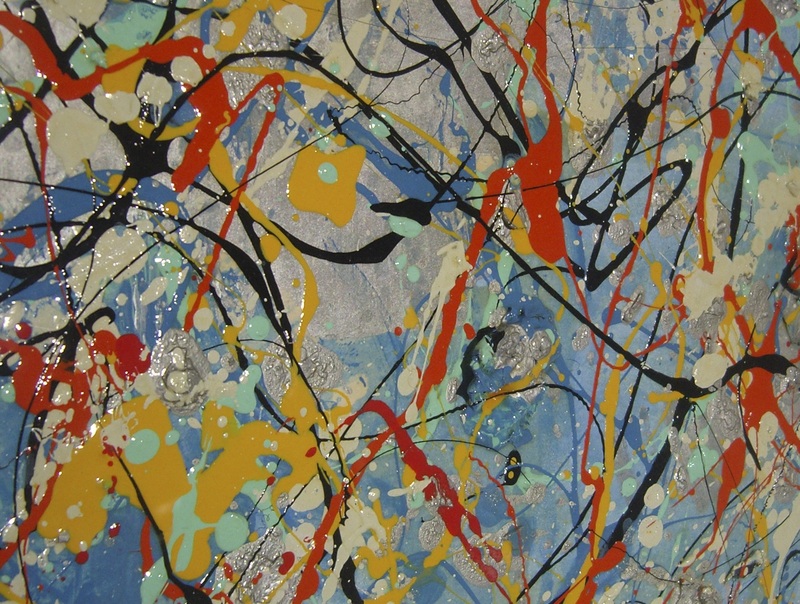 To this day, Pollock’s tumultuous life continues to fascinate the world of arts. In New York City in the 1940s, Jackson Pollock was introduced to liquid paint and the pouring method by Mexican muralist painter David Alfaro Siqueiros. He combined this pouring technique with others, and he articulated his innovative vision into the Male and Female and Composition with Pouring I paintings in 1943. An authentically American creative process, the pouring method Pollock developed was directly influenced by the Navajo sand painting tradition. 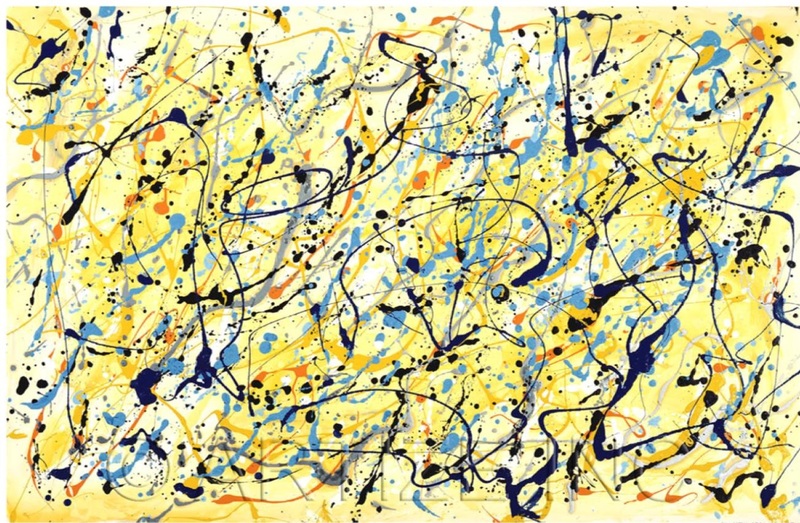 When he turned to dripping, Pollock freed himself from easels and laid down his canvases on the ground so he could pour out his genius and his acrylic paint in the form of drops and droplets. The painter gave his utmost attention to the selection of tools and material, their textures, viscosity and fluidity. Liberated from artistic norms and conventions, Pollock explored new opportunities through the use of hardened brushes, wooden sticks and even syringes as vehicles for paint application. Even if his paintings may appear, at first sight, chaotic and frenetic, the painter’s unique technique was elaborate, intricate, precise, and artfully mastered. 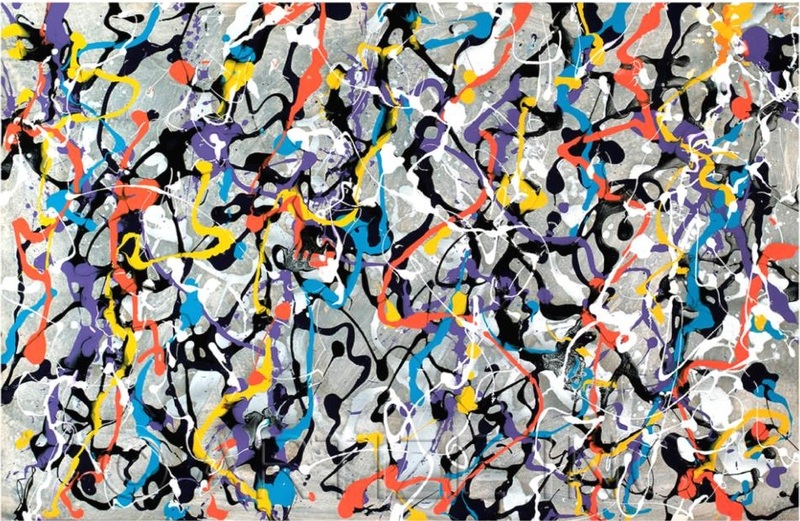 Pollock’s paintings are considered to be the first manifestations of Action Painting, where the subject of the art piece becomes the fundamental and conscious choice of the artist. He executed his vision without initial drawings and through using choreography – like a dancing ritual around the altar of a white canvas flattened out on the ground. 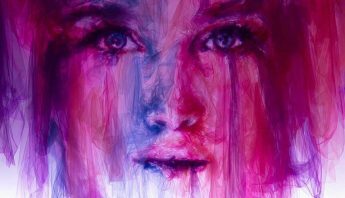 In a perfect symbiosis with the paint, the painter’s movements and the laws of gravity worked in unison to create revolutionary art. The direction of a line, the color of a droplet, the position of shapes, forms and empty spaces. Rather than hesitations, we see assertions and conscious decisions where lines are melding and covering one another. It is truly an internal dialogue that is represented on the canvas. The transcript of this introspective conversation in the mind of the painter is reproduced drop by drop, line by line, and point by point. The temptation to summarise Pollock’s work as a spontaneous and spasmodic expression of his passion has seduced many. Numerous interpretations of his art have reduced it to a production derived from an unarticulated and self-destructive process possessing his soul. Indeed, Pollock is characterized by an explosive fury that guided his life and his art. 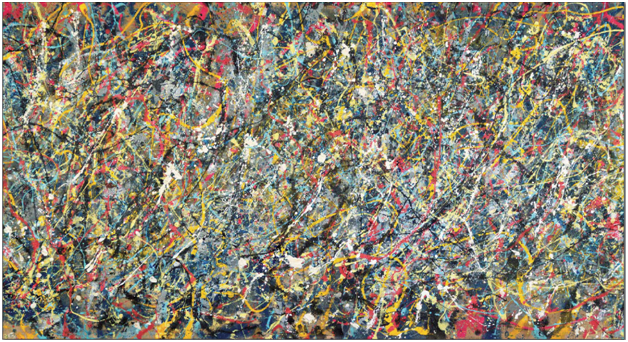 However, beyond that, Pollock was consciously soliciting every part of his body and mind when he splashed, dripped and poured domestic acrylic paints. When we admire the painters work today we can picture him moving, jumping and leaping around the cotton canvas. Many films and photographs dating to the 1950s have immortalised Pollock’s performances in his studio. These moments, captured on film for posterity, are considered by many art historians to be the foundational ones of Abstract Expressionism and American Modern Art. Pollock’s artistic revolution generated many debates among art critics of the time. Famous American art critic Clement Greenberg, undoubtedly influenced by classical conventions, saw Pollock’s work as art only when it was displayed in its verticality. On the other hand, fellow art critic Harold Rosenberg understood the stylistic risks and the revolutionary process Pollock was experimenting with. To Rosenberg, once the paint had dried on the canvas, the painting was merely a fossil of Pollock’s genius. 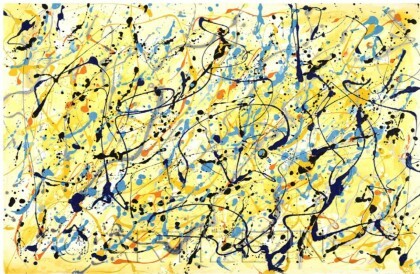 Pollock’s brilliant career had led him to the frontiers of his own creative vision. But his personal life was not as brilliant, and in the 1950s, alcoholism and infidelity pushed Krasner to leave her husband and settle in Europe. Shortly afterwards, Pollock’s pictorial revolution was abruptly ended when he died in a tragic car crash in 1956. His mistress Ruth Klingman survived the accident. Soon after his death, it seemed many works allegedly painted by Pollock resurfaced on the art market. His style was certainly deemed more easily imitated than Renaissance and classical paintings, and many copies were created by forgers. Authentication of these paintings alongside other authentic pieces posed a huge challenge, given that Pollock rarely signed his work. In the midst of these developments, Dr Armin Hershkowitx, a New York-based Abstract Expressionist art collector, acquired a small private collection of paintings from a woman seeking to withhold her name. Unable to find any buyer for this collection, Hershkowitz sold it to Gabor Nemeth, a fellow collector and art conservation specialist, in the 1960s. Nemeth kept some items, sold a few for a low price, and some were stolen from his conservation storage. One of these paintings he had sold in the 1970’s, to a West Coast furniture designer, received formal authentication by Lee Krasner. Hearing of the news many years later, Nemeth sought to obtain the same stamp of authentication for each of the Pollock pieces. In 1985 the Pollock Krasner foundation was founded by Krasner to celebrate her late husband and to encourage artistic endeavour around the world. However, beyond patronage the Foundation also aimed at authentifying Pollock’s work and establishing a catalogue raisonné through the Board of Authentication, which operated from 1990 to 1996. When Nemeth tried to approach the Board in 2002, this brand of the Foundation had been disbanded following many legal disputes and a public controversy that had captivated the art world. 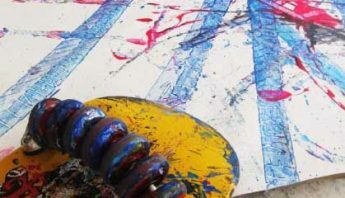 Nonetheless, technological advances and the keen interest of a community of forensic scientists allowed for the emergence of new authentication techniques, such as DNA cross-analysis or fingerprint analysis – from the sample of Pollock’s cousin, scientists could compare the Pollock family DNA with that of hairs found in the paintings. In addition, mathematical tools were employed to analyse patterns and fractals in identified Pollock paintings and unsigned works. 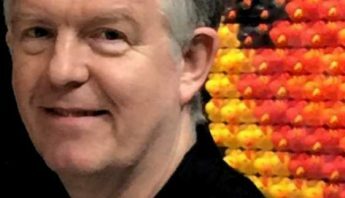 Dr Richard Taylor, leading this team of experts, published his findings in the prestigious scientific journal Nature: “the larger fractals are, in a way, the painter’s movement signature, his imprints. The smaller fractals are also evidences of the painter’s decisions: the distance of the body to the canvas, the fluidity of the paint or the angle and strength of its trajectory”. Hence, despite the silence of the Krasner Pollock Foundation, many inspired individuals hailing from various professional fields have contributed to the preservation of Pollock’s legacy, once threatened by a saddened and revengeful soul. The paintings from the aforementioned private collection is showcased at Art Monaco 2015. We will be visiting it like the relics of one of the greatest controversies of the history of art.